Father Rick Ginther has already traveled to Colorado for a silent retreat, spending eight days trying to sharpen his ability to find God in the everyday realities of life. His travels also include a pilgrimage to Greece and Turkey, where he is following in the path of St. Paul to gain a better understanding of the saint who turned his life toward Christ. He also plans a road trip to Canada to deepen his friendship with a college classmate. All those adventures are part of a nearly four-month sabbatical for Father Ginther that has been made possible by a grant from Lilly Endowment Inc. and its 2011 Clergy Renewal Program for Indiana Congregations. “The program allows pastors to step back from their busy schedules and renew their spirits for challenges ahead,” according to Lilly Endowment official Gretchen Wolfram. Another goal of his journey is to connect with his faith ancestors. During the retreat in Colorado, he focused on the approach to life adopted by St. Ignatius of Loyola. 10-day pilgrimage that began on Sept 14. Father Ginther knows that insights about life can come in many ways. For him, they sometimes surface during the bicycle rides that are part of his life and his sabbatical schedule. He also found a sense of perspective in a greeting card that he received during his silent retreat in Colorado. As he opened the greeting card that celebrated his 61st birthday on Aug. 25, Father Ginther experienced an overwhelming reaction. 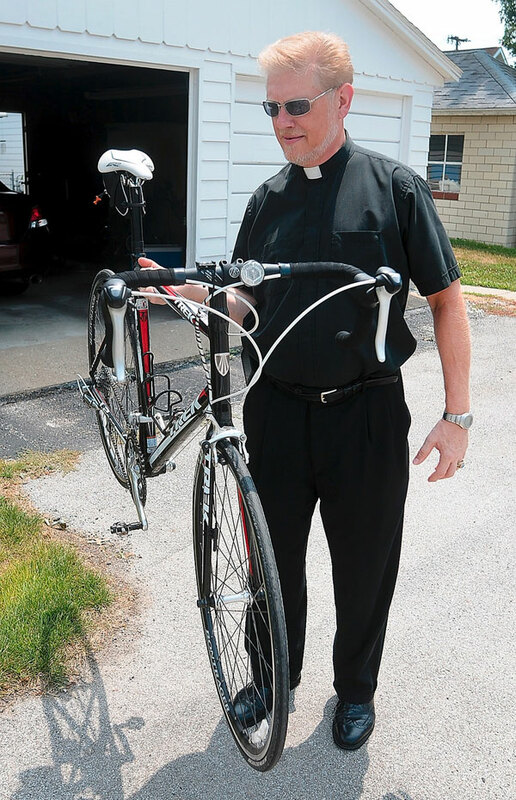 In his mind, he suddenly could see nearly every person who has influenced his life—his parents, his siblings, friends, former teachers, old classmates, mentor priests, and parishioners from the past and the present. He wants to have that same perspective when he returns to Terre Haute and his ministry as a pastor on Nov. 21.